Over the course of the years, customer satisfaction has proven to be one of the most important factors of building a truly successful business. Whether it’s retailing, legal consulting services or software, the amount of value happy customers generate is just immense. This is why caring for your customer base has become a crucial priority in the modern business world. So no wonder that there are tons of best practices, strategies, and tactics to choose from that help you take user experience to the next level. The diversity is by any means great but it’s also confusing. Because at the end of the day, you need to decide what’s right for your business and what’s not. And one of the talking points in the customer satisfaction domain is live chat. Is it really worth going into the trouble of setting up a live chat tool and spending resources on keeping it up and running? The short answer would be: definitely. As in any real shop, customers usually have doubts and want a piece of advice before purchasing something. And it’s not an exception on the Internet. If you don’t happen to have live chat, your users would need to find a way to get in touch with you. Since waiting hours for an email is hardly convenient and phone assistance is not for everyone (let’s get it straight), live chat is a beautiful combination of real-time support and handiness. Besides increasing your chances of closing the deal with a potential client, you can also up-sell other services and goods. Remember that timing is deciding so the more speedy your reply is the better. Apart from that, live chat can be a great source of feedback you can act upon and then streamline your processes in a more efficient way. It especially holds true for SaaS platforms that are dependant on connection and communication with their paying customers. By asking the right questions, you can understand why your customers might churn, where they experience difficulties the most and what you can do to improve it. Not to mention the infamous Net Promoter Score you can easily get via live chat. I’ll level with you, you will need the right kind of people to assist your clients. And it goes for live chat, email, and phone support but with less impressive results for the latter two. All in all, live chat is a powerful tool ensuring a smooth user experience of your customers. Starting from user acquisition to onboarding and engaging. Tons of business already shifted their focus on customer satisfaction and adopted the live-chat approach to get the most of it. 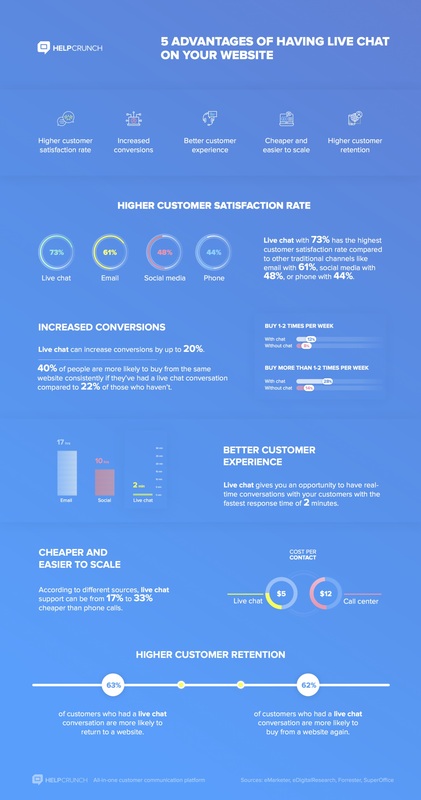 If you are still in two minds about what customer care channel is the best, we invite you to check the infographic below that lays out 5 important advantages of having live chat on your website. These are backed up by statistics and data so you can easily compare the cons and pros and make an informed decision. Infographic provided by : Helpcrunch.